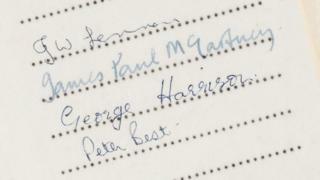 The Beatles' first recording contract has been sold at auction in New York for $75,000 (£48,000). The 1961 contract resulted in the single My Bonnie, a rock-and-roll version of a children's song. It was released under the band name Tony Sheridan and the Beat Brothers, but caught the attention of Brian Epstein, who became the band's manager. The six-page contract was sold by the estate of German Beatles collector Uwe Blaschke, who died in 2010. In the early 1960s The Beatles regularly performed at nightclubs in the German city of Hamburg, where the contract was signed. The band had been backing British singer Tony Sheridan at Hamburg's Top Ten Club at the time. The contract includes the signatures of John Lennon, Paul McCartney, George Harrison and drummer Pete Best, who was later replaced by Ringo Starr. "Had they not spent this time in Hamburg, they may have not become the musical force that they did," said Dean Harmeyer, consignment director at Heritage Auctions, which sold the contract. "Had they not recorded My Bonnie they may have never come to the attention of Brian Epstein." My Bonnie was released only in Germany. The following year, with Brian Epstein as their manager, The Beatles recorded "Love Me Do," their first hit single under their name.